Aloha! Lower Campers had a blast, playing and splashing, celebrating beach day. 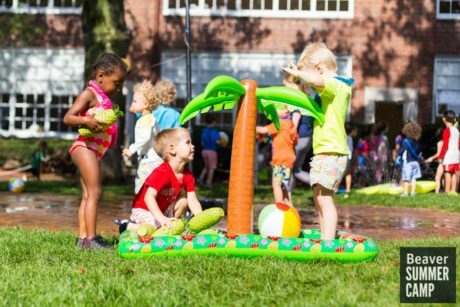 Inflatable palm trees, water, leis, hibiscus flowers, and hula hoops make the party feel downright tropical! Check out more pictures of the fun on Facebook! The ever active Middle Camp participated in their annual Olympic Games this week! 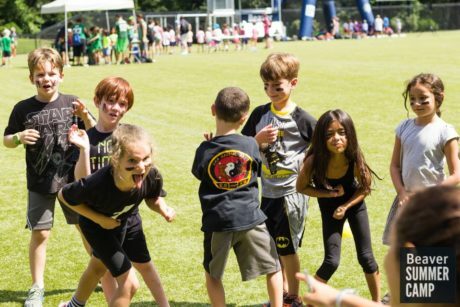 Comprised of both sporting and NON-sporting events, there was something for every camper to enjoy! Middle Campers, who were organized into teams featuring every color of the rainbow, needed to work together to complete each task successfully. Make a Shot on a Counselor! To see even more photos of the action, head to Facebook! Speciality camp Building the Band wrapped up their week with a festive concert featuring the group “Angry Pirate – Zombie Hunter” in the Black Box Theatre. 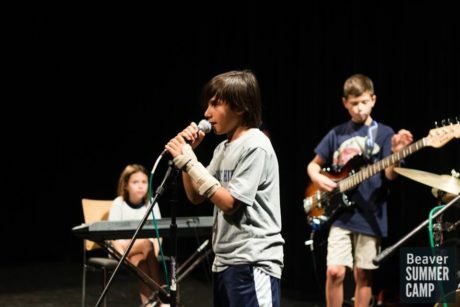 An all-camper band, kids played drums, guitar, piano, and bass to show off their skills! Check out more photos of the band’s stellar performance on Facebook!